You will find dozens of fun things to do in Monterey, CA. This cute waterfront town is about two hours south of San Francisco and it's a popular day trip. You can also spend a night or two to explore even more of the city and the area. Some of my top picks include whale watching (one of the best places for this in the area), kayaking, and visiting top attractions. You will also find some great places to shop, eat and sample some of their top local wines. The #1 attraction on my list of the top things to do in Monterey is to go whale watching. The waters off the coast offer abundant food for whales migrating through the area. Many are either heading north or south and often spend some time in and around the Monterey Bay. You will find them all year long here: In the winter, you will typically find gray whales cruising past. Humpback and blue whales are often spotted between May and November. In addition to all of the whales, you will also see a variety of other wildlife on these tours including dolphins, sea otters, tortoises, and all kinds of birds. The tours are slightly different based on the season. Pick up tickets for the winter whale watching tours. Find tickets for the rest of the year (March - early December). You will also find plenty of highly rated attractions in Monterey. An absolute must see is the Monterey Bay Aquarium. It's home to 550 species of animals and plants from the Monterey Bay. I could spend hours watching the animals swim around in its 35-foot tall and 90-foot wide open sea aquarium. Find tickets online so you don't have to wait in line! Other top attractions include its museums such as the Dali Expo and the Museum of Art. You can also spend some time at the beaches or check out the 17-mile drive. There is no shortage of places to shop in Monterey. 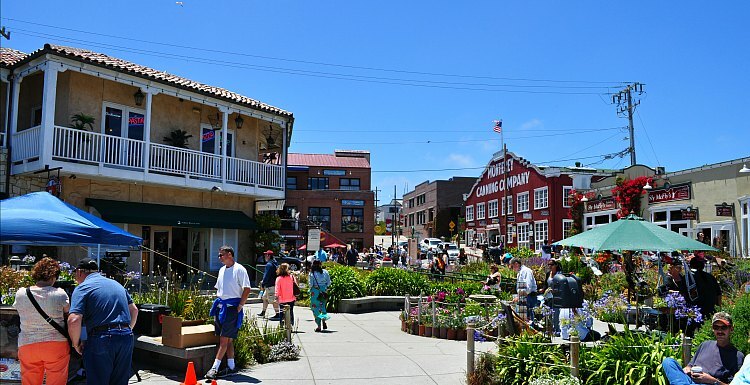 You will find that most people flock to Cannery Row for unique items, antiques, and gifts. Another pick in Monterey is the Del Monte Shopping Center. Here you will find plenty of department stores and name brand items. Carmel-by-the-Sea is another fun place to go shopping in the Monterey Bay Area. It's cute downtown offers small boutique stores with everything from local galleries to clothing. Other picks here include The Barnyard Shopping Village, which is an outdoor shopping center with plenty of boutique shops. One of my favorite things to do in Monterey is to check out the local wines and beers. You will find dozens of places to sample some of the best right in Monterey. My favorite place to sample wines is The Taste of Monterey. Not only do they have a great location selection, but great views of the water from some of their seats. Carmel Valley is also less than an hour away, where you will find more than 30 winery tasting rooms. You can rent a car for the journey, or better yet, take the Grapevine Express, which offers front door service to many select wineries in the region. You can then easily walk to others nearby. Some of my favorite local brewers include Alvarado Street Brewery (426 Alvarado Street), Peter B's Brewpub (inside Portola Hotel), and Fieldwork Brewing (560 Munras Avenue). Around the bay, you will find some other great breweries including Post No Bills Craft Beer House (600 Ortiz Ave in Sand City) and the Carmel Craft Brewing Company (Big Sur Barn, 3777 The Barnyard in Carmel-By-The-Sea). Monterey's flat waterfront trails make it a fun place to go bike riding. The best way is to rent a bike and head out on your own. You will find a biking trail all along the water in Monterey and it will take you over to Pacific Grove. 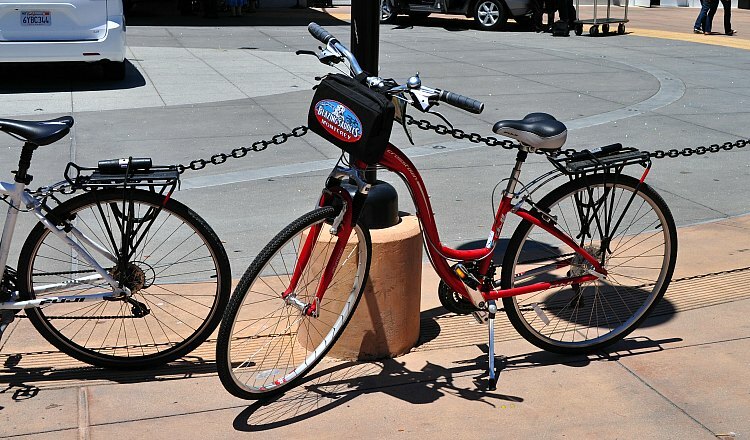 Your bike rental company will provide you with a list of routes including a map to help you find your way. The calm waters of the bay make it a great place to go kayaking. You can either go on your own or on a guided tour. If it's your first time, you can also take a lesson or go on a short family friendly journey. It's great for the entire family and a perfect place to learn. You will also get some amazing views from the waters looking back at Monterey and the Bay area. Monterey and the surrounding communities have several amazing golf courses. Here you can find the world class courses of Pebble Beach. 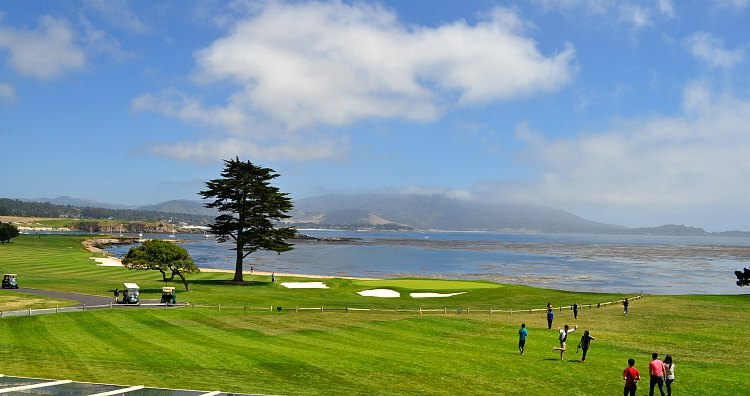 Five of the eight courses in Pebble Beach are open to the public. The AT&T Pebble Beach Pro Am tournament also comes to town every February. If you happen to be here during that time, make sure to get in on the action. You can also play local courses in Monterey, Carmel and Pacific Grove. Another recommendation for things to do in Monterey is to head out on a tour. You will find dozens of options. Here are three of my favorites. History Walking Tour: If you love history, you are going to really love this two-hour tour. You'll walk past legendary places featured in the writings of John Steinbeck and other spots that were important to the early Spanish explorers. Your expert guide will tell you stories about both historic and recent events that have shaped the area. Find tickets for this tour (runs most Thursdays - Sundays). Sunset Sail: Taking a sunset sailing cruise on the Monterey Bay is a treat for the senses. For two hours, you will cruise around the bay and relax with some white wine and appetizers. You'll see some wildlife during your journey and, if you get lucky, you might even see a whale. The highlight of the trip is the chance to see the sunset over the gorgeous Pacific Ocean. Runs daily. Pick up your tickets in advance. Monterey Food Tour: Sample local dishes on this fun 3-hour food tour. You'll try everything Monterey has to offer including foods such as Greek, Indian, or deep-dish pizza. You will sample local wines as you learn more about popular cheeses. You will also get the chance to enjoy some of our best locally made ice cream. All tastings are included. Grab your tickets today. Another one of the fun things to do in Monterey is to discover more about its history. Monterey has been an important stop for travelers for as long as it has been here. Stop by the Custom House near Old Fisherman's Wharf. This is the oldest government building in California. It was the place where they collected taxes (which they used to call customs) for ship coming into the Monterey Bay during the mid-1800s. California's oldest cathedral is also here in Monterey. It is known as either the Royal Presidio Chapel or Cathedral of San Carlos Borromeo. It was built in 1794 and is still used today for Catholic Masses. If you love art history, make sure to stop by the Dali Expo where you can learn the history of how this famous artist influenced art in the area. He lived here on and off for eight years in the 1940s and was well known to the local artists. My final recommendation on my list of things to do in Monterey is to head out for a hike. You will find a variety of terrain here which will excite hikers of all levels. You can do a leisurely stroll along the Monterey Coastal Trail if you are looking for a flat trail that isn't too hilly. Another great, easy trail is at Jack's Peak Park. It has 8+ miles of trails, but also has a parking lot fairly close to the summit if you'd rather drive up and then walk the rest of the way. One of the more challenging hikes nearby is the North Shore Trail in Point Lobos State Natural Reserve. This trail will get your heart pumping. Don't forget your camera as that effort leads to some great coastal views. If you really want to get away from it all, head out to Toro County Park in Salinas. You will find wide open spaces with several moderate and more difficult hiking options.